A number of new infrastructure projects are set to leverage Hong Kong as potentially the most desirable tourism destination in Asia, with some calling it the beginning of a “golden age” of opportunities. The special administrative region’s newest developments include enhancing its connectivity to mainland China through a new Express Rail Link and road via the current longest fixed link in the world, the Hong Kong – Zhuhai – Macao Bridge, opening up new opportunities for the city to become an integral part of a 21st century Maritime Silk Road. Lavish plans to build up the city, neighbouring Macao and China’s tourism potential were revealed last week to 1000 delegates from across 34 countries at the “Leveraging Belt and Road Initiative & Guangdong-Hong Kong-Macao Greater Bay Area Development” Convention, organised by the HK Government, the Hong Kong Tourism Board and the Travel Industry Council of Hong Kong. 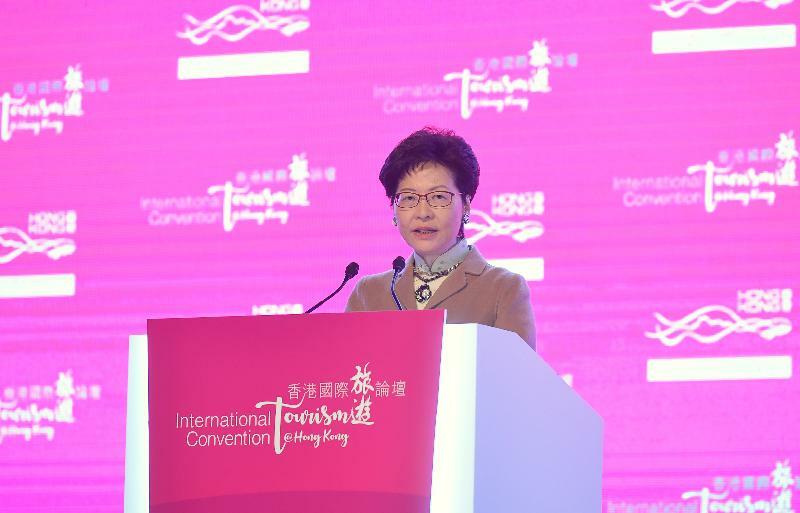 Hong Kong’s chief executive, Carrie Lam highlighted the importance of “developing people-to-people bonds”, adding, “tourism exchange is a powerful means of promoting such bonds”. Lam said multilateral co-operation was integral to the Belt and Road Initiative and to tourism development for the region. “Easing visa regulations, expanding flight connections, enhancing cultural co-operation – these and other considered measures can only help boost tourism and the rewards they offer us all,” Lam told delegates. “The Belt and Road Initiative is also about capacity building and sharing benefits. Hong Kong is an international hub for professional services. We also run one of the largest hospitality and tourism schools in Asia. We have the expertise, the experience and the institutions to provide services to other economies along the Belt and Road on tourism infrastructure developments, as well as train professionals for the tourism industry,” she said. In developing regional tourism, Lam said multi-destination visits would be effective, encouraged by the new connectivity now opening up nine neighbouring Mainland cities of the Guangdong-Hong Kong-Macao Greater Bay Area – namely Guangzhou, Shenzhen, Zhuhai, Foshan, Huizhou, Dongguan, Zhongshan, Jiangmen and Zhaoqing. In developing the Greater Bay Area, including the Hong Kong section of the Guangzhou-Shenzhen-Hong Kong Express Rail Link, the Hong Kong-Zhuhai-Macao Bridge and the new Liantang/Heung Yuen Wai boundary control point connecting Hong Kong and Shenzhen, together will form a “one-hour living circle” between Guangdong Province, Hong Kong and Macao. “The Greater Bay Area has the means to rival Tokyo, San Francisco and New York – the world’s three renowned bay areas – in tourism potential. With a collective population of 70 million, the Bay Area boasts a combined GDP of some US$1.5 trillion, that is roughly the size of Australia or South Korea,” Lam said. Tourism to Hong Kong contributes 5 per cent to its GDP, with the city welcoming more than 58.5 million visitors in 2017 – 48 million of which from Mainland China. Hong Kong once again also earned its rank being named the world’s most visited city by Euromonitor. Hong Kong Tourism Board Executive Director, Anthony Lau spoke of the importance the new connectivity will play to tourism for the city, saying by “combining the firepower of 11 cities, it will make the whole region a more attractive proposition” for tourists and business travellers alike. “If we market Hong Kong as a mono-destination, with limiting infrastructure, Hong Kong tourism will be gone in 10 years,” Lau said, adding “we must work together with our partners in the region to combine efforts and resources to become bigger and better”. “Hong Kong is ready to open a new chapter, and this is game changer,” Lau said of the new “super connectivity” to China. The Belt and Road Initiative has also gathered momentum since China President Xi Jinping announced plans in 2013, with more than 120 countries indicating support for the initiative, which is said to provide new impetus to the global economy. “Hong Kong as the world’s most visited city, freest economy, top financial centre, safest city, and one which has one of the world’s best educational facilities and the world’s top hotel brands, is your ready partner to leverage on the opportunities offered by the two initiatives,” Hong Kong’s Financial Secretary, Paul Chan, said. STA agents see the real Fiji, The Bachelor joins Emirates’, Live like a local, and where is Helloworld popping up?